At ScanCorner we include everything necessary for a high quality result at a very competitive price. Don’t settle for less! With sophisticated technology, the scanning process can be partially automated today. For example, slides can be captured and transferred to the PC through automatic scanners with relatively little effort, which is reflected in the low prices of some of some providers. What is often forgotten here is that a substantial part of the work is not yet included and is then usually charged with additional fees, such as. cleaning, cutting or simply just the manual image correction! After scanning, our well-known promise of quality comes into play. Each of your images is manually reworked by one of our employees. All adjustments are tailored to the specific image which is subsequently examined for possible image errors. This manual work entails removal of dust, minor scratches, minor cracks, and also adjustment of the contrast and colours to give your old memories a new shine. Please note that for the optional TIFF (4000 DPI) output, this postprocessing is carried out on TIFF files, with output to JPEG images. This means that for the TIFF option, you receive the 4000 dpi raw data in TIFF format as well as the post-processed images with corrections in JPEG format. Only when this manual post-processing step is completed, will your online gallery be unlocked and you can then check the scan quality. 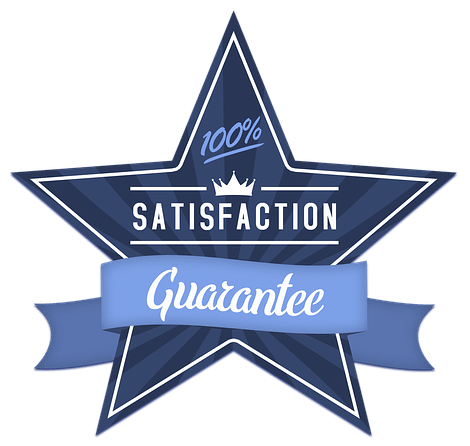 If you are not satisfied with the final result you can give us feedback and we will consider what actions are necessary for remediation. After we have received your order, each individual picture or film is cleaned manually by our employees. Whether dust or dirt from storage, everything is removed as much as possible. Following this, your analog format will be digitised. It all depends on the resolution and the equipment! 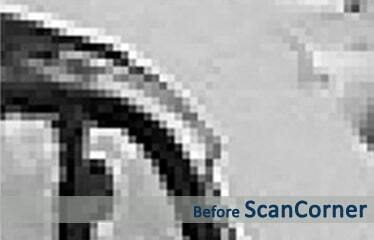 The quality of the resulting scan file depends primarily on the quality of the equipment used, and the resolution setting, measured in DPI (dots per inch). The resolution indicates how much of the information can be filtered out of the picture. These details are measured in pixels, which are the smallest units that can be displayed on a computer. 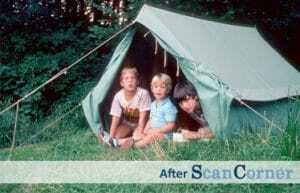 The scan resolution, which is shown in the pictures below, affects how sharp the image will appear at a given size. The lower the scan resolution, the blurrier the image will appear when it is enlarged. In practice, this means that the resolution determines what the maximum size is that the image can be printed or displayed at while still appearing sharp. We are convinced that scanning needs to be done at a high quality right from the start so that you are able to produce good prints of your pictures. For example, if you want to create a photo book, it is often necessary to enlarge images or parts of images. For this reason, we scan all the photos at a very high resolution so that you can use your photos for all kinds of purposes. Furthermore, we use high end equipment that maximises the sensitivity of each measured pixel in the resulting file. This helps ensure minimal loss of colour detail during the scanning process. What is the correct resolution for my order? The most important measure of digitisation is the resolution of a scanned slide, photo or negative. This is specified in DPI in the digitisation process. DPI stands for “dots per inch”, i.e how many pixels per inch (2.54cm) are available. The higher the number of pixels for a given length, the higher the scan quality. But does it always have to be the highest resolution? Would you like to view your pictures mainly on your mobile phone or tablet or print out some of your pictures on A3 sized paper as a poster? For the vast majority of cases a scan at a particularly high resolution (4000 dpi for negatives or slides) for poster printing is rarely required. Also, it leads to large files which then again require more disk space, more memory, and reduce the responsiveness of your electronic device. It should be noted that the maximum resolution may vary depending on the medium. For example, a maximum resolution of 1200 dpi is possible for a photo, while for slides and negatives a resolution of 4000 or 5000 dpi is possible. Other vendors advertise far higher resolutions, but while these are technically possible with the latest scanners, the “true” resolution of the output files is unspecified. ScanCorner scans slides and negatives at 3000 dpi and paper prints at 600 dpi, which is the optimal compromise between quality and file size. On request and for a small surcharge we also scan these formats with 4000 dpi or 1200 dpi. So which is the right file format? The name JPEG goes back to the Joint Photographic Experts Group, which developed this file format. The advantage of the JPEG format lies in the small memory size and high compatibility. It also supports the EXIF, IPTC and XMP metadata of each image. However, the weaknesses of this format should also be considered. Due to the small file size it a loss of image quality results, and so each image only has a color depth of 8bits per image channel. Despite these drawbacks, this format is ideal for archiving analogue photographic material. The Tagged Image File Format (TIFF) is the “standard resolution” for high resolution images for professional applications. Compared to the JPEG format, the TIFF supports a color depth of 32 bits per color channel, which means that a TIFF image contains considerably more image information. The enormous color depth also results in a very high file size per image. With an additional incompatibility of standard image programs, this format is least suitable for the archiving of images. We recommend this format only to photographers who want to revise the images themselves. 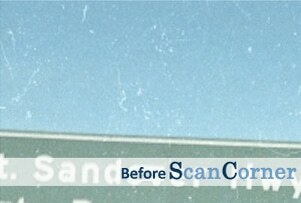 Scratches and other unwanted spots on scanned images are caused by either actual damage or by exposure to hair, dust and dirt. The scratches on the surface are not easily discernible by the human eye, but often show up more clearly when the images are scanned and enlarged. Photo and film material, or documents are likely to have been stored for years in archives, attics or basements. Although the media is stored in boxes or slide magazines, over the years a layer of dirt is formed. But not only dirt, which can be removed manually or mechanically, but scratches or even small cracks are caused by years of storage. It is very annoying when an image becomes unusable due to image irregularities. First, we clean all media so as to minimise the number of scratches even before scanning. However, this can prevent only a small fraction of the potential scratches from showing up. Then, during the digitisation of the photographic prints and negatives, we use Digital ICE – reliable, hardware-based dust and scratch removal process by Nikon. In the case of black and white negatives and slides, where the ICE method cannot be applied, we manually remove scratches. Large scratches cannot be removed using the Digital ICE process, so in that case we rely on manual processing. 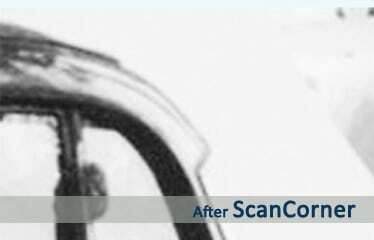 The scanning industry has recognised this problem and has equipped numerous scanners with the so-called digital ICE function, which allows removal of scratches as well as dust by specialised hardware in the scanner, and thus to increase the quality of the resulting scan. 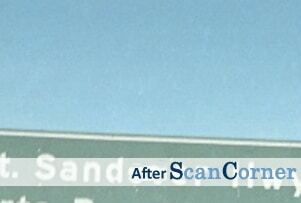 Digital ICE means Image Correction & Enhancement and is incorporated by some scanning companies into their scanners, including those used by ScanCorner. But what makes this technology so special, and how does it increase the scan quality? Despite what many customers assume, the ICE process is not integrated into the scanner software, but is a special hardware feature. In each scanner, in which a digital ICE process is installed, in addition to the scanning device, an infrared light also exists. 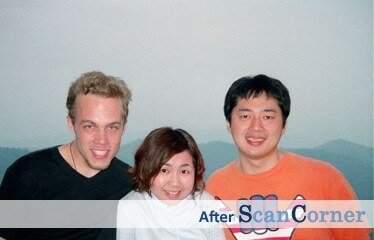 which scans during the scanning process, the surface of the slide or negative. As you may know, both slides and negatives have smooth surfaces. If the infrared beam detects bumps, e.g. dust or scratches, on the surface of this image, the error is compensated by software. This repair is done using the surrounding image information, which is used with an algorithm to replace the missing piece. Several independent tests have shown that this process works almost flawlessly and that a large part of the scratches can already be removed during the process. For black and white slides and negatives, however, the ICE process is not possible due to the infrared opacity of the silver layer. If you still use the digital ICE on such media, the negative is digitised out of focus. As a result, the manual post-processing and digital image optimisation of black and white negatives and black and white slides is more complex, and thus more expensive than color digitisation. With negatives, slides and photos, the colours change over time in different ways. 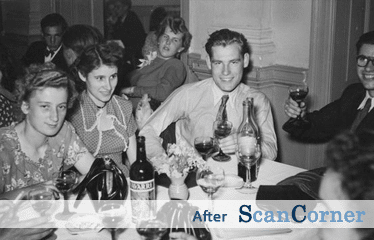 Therefore, an essential part of our scanning process is to aim to restore the original colours. While many of the service providers that offer this correction use an automated process, we do it manually and select the appropriate color correction for each image individually. Of course, the adoption of automated methods has certain advantages. However, we believe that simply placing the slides into the scanner and hoping for the best is not the best method to achieve the appropriate quality. To ensure each image is optimally corrected, we do the colour correction by hand with each image being scanned and improved individually. Each image is correctly oriented where necessary (to save you tilting your head during a slideshow! ), or otherwise spending valuable time reorienting your images. 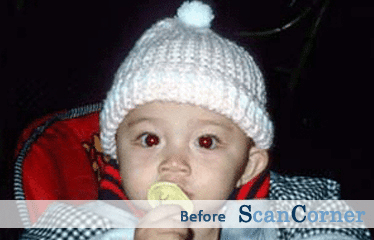 We remove ugly red-eye caused by the use of flash. If you have grouped your images into batches (e.g. in labelled envelopes) they can be scanned in a certain sequence. Simply number them (i.e. write on the envelope cover). e.g. negative sleeve no. 1, negative sleeve no. 2, etc. and group the batches (envelopes) accordingly. All your images will have unique file names within your order, e.g. IMG1001.jpg, IMG1002.jpg, etc. This means two images of different folders (even of different media types) will always have different file names. This will make things easier for you in case you later want to move images between folders. 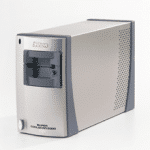 At ScanCorner we mainly use the Epson scanners V800 and V750. 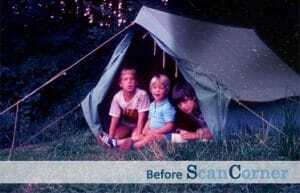 After several years of using the legendary Nikon Coolscan 5000 ED, we switched to the Epson scanners, as they achieve at least as good results but work faster. The scanners are equipped with the Epson Dual Lens System and support the DIGITAL ICE ™ technology, which allows us to consistently achieve outstanding scanning quality. Our Epson V750, V800 and V850 models are flatbed scanners that scan up to 6400 dpi optical resolution for movies and 4800ppi for reflective images. The Epson Workforce supports the scanning of larger items. Depending on the resolution, the scanning of each image – at high scan quality – takes between 3 and 5 minutes (normal sizes) and about 2-3 minutes longer for TIFF formats. 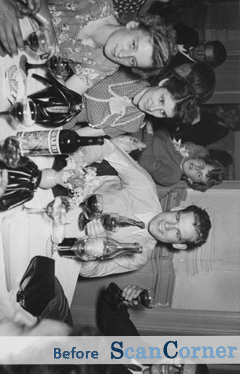 During this time, the image is both scanned and digitally cleaned by the removal of dust and scratches using the built in digital ICE hardware. 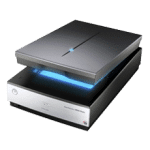 The Epson scanners can process documents up to A3 in size placed on the base, but it is also possible to scan slides and negatives with the transparency unit that is built into the lid section. 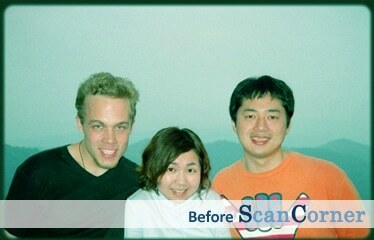 At ScanCorner, each of your images is manually reworked by our staff. This is not an empty advertising promise, but a key quality feature and is included in our standard service! Only with this process, can we guarantee you our first-class scanning quality.